Share your good feelings and you may be rewarded! And I’m not just talking about karma. Tweet @TicketsatWork about a wonderful experience that started with tickets from TicketsatWork.com or tell us how employees benefit from using the largest travel and entertainment corporate benefits program in world, and you can win a $100 TicketsatWork gift card! We are going to kick off SHRM this year with a Twitter Sweepstakes. 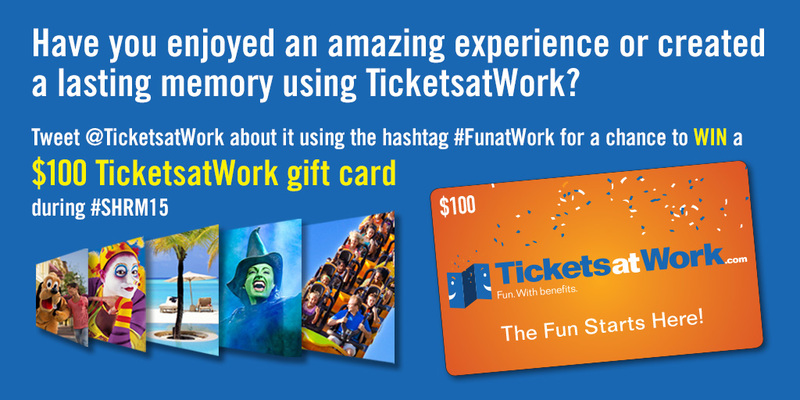 Starting June 28th through July 1st, tweet us with either a memorable moment or testimonial about TicketsatWork and hashtag #FunatWork to enter for your chance to win a $100 gift card redeemable at TicketsatWork.com. We will be announcing TWO lucky winners on July 2nd on Twitter! Read the Terms and Conditions. If you’re wondering what you could buy with a $100 gift card to TicketsatWork, the possibilities are so enticing. Buy a bunch of movie tickets? See a New York Yankee game? Dine with Pirates or Mickey Mouse? Take a selfie with an Aztec pyramid? Become a Minion at Universal Orlando? Hear the snap of an alligator on an airboat tour? Feed and Touch a Dolphin? An explorer at heart, Alex Mateo writes for TicketsatWork.com and is always ready to plan his next trip.